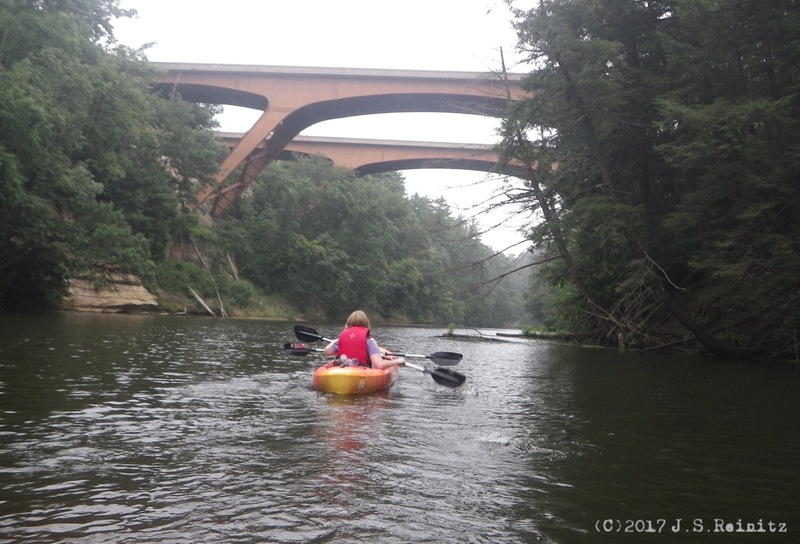 After about 20 minutes of hard paddling, my glasses began to fog up, obscuring the swift water. 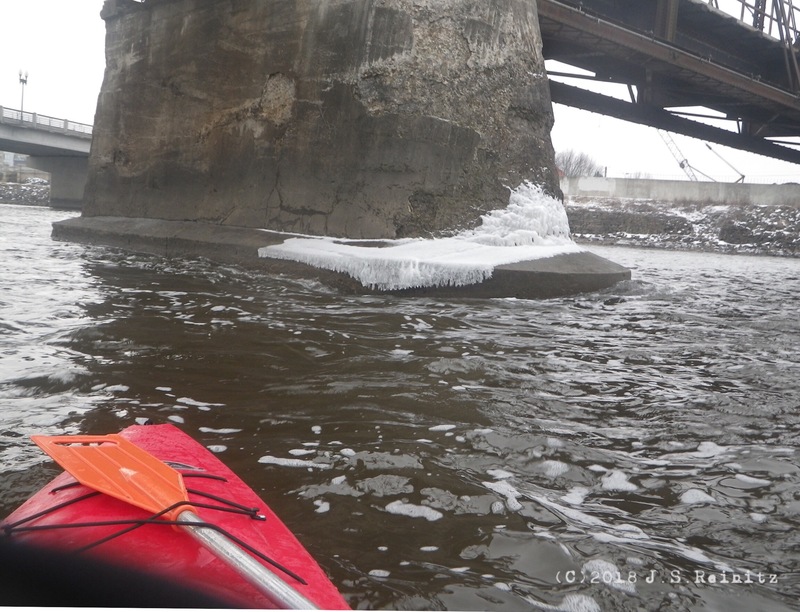 The kayak’s nose was a red blur in front of me with two smaller red blurs cycling on either side of me, my paddle blades trying to keep up with the current. The plan had been to put in at the park and head upstream under the railroad bridge and then play around just below the dam in a relaxing fashion before drifting back down to the ramp. But just after launching, I realized how quick the water was moving, and the fight was on. It was early in the morning, and everyone was at home asleep. It was cold, overcast windy. Ice formations clung to the rail bridge piers. It was spring break in the Midwest. 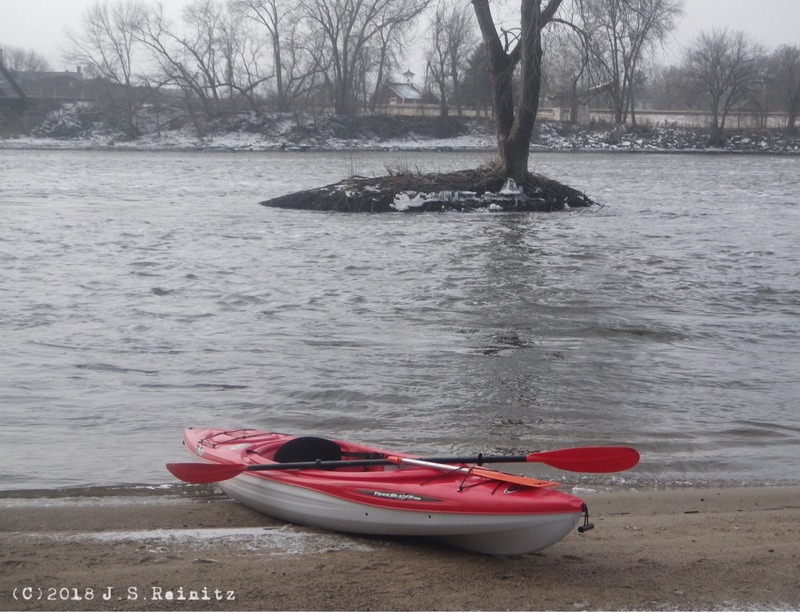 Time to get out and enjoy kayaking. There is a certain amount of dread that creeps in when you strain to push against the current and after several minutes, you glance to the side and see the shore and notice that with all your work you are only holding ground — like a big water sports treadmill. After inching past the rail bridge, I cut to the right bank where I spotted a small cove with calm water. A wave washed into the cockpit, the icy water freezing my hip numb. So much for my plan to stay dry. I slowly inched across, mindful of the strainer — a large toppled tree with all of its branches intact hanging in the water — immediately downstream. If I collided with the strainer, I would likely be knocked from the boat, forced underwater and held down by the power of the water rushing through the branches. A flock of geese watched me drift into the cove exhausted. They flapped around and walked over to the bank as I landed on a sandbar. 6:30 a.m.: Come up with idea for an early morning kayaking trip because I can’t sleep even though it’s the weekend. 7 a.m.: Grab 4-liter Sea to Summit dry bag containing compass (in case I get lost), whistle (in case I need help) and Gerber knife (in case of something), and slip out while everyone else is asleep. 7:15 a.m.: Drive off with kayak, paddle, backup paddle (in case I lose the paddle) and life vest lashed to or otherwise stowed in the Jeep. 7:24 a.m.: Reach the shore, ease into the kayak with the plan of circling the Island of No Worries, begin paddling upstream. 7:35 a.m.: Spot a yellow and orange bobber tangled in a mass of tree limbs reaching up from the river. Liberate it with the knife (so that’s why I brought it), spot a fishing lure in the same mass and collect it as well. Continue on. 8:05 a.m.: Reach the upstream tip of the island, begin traveling downstream on the other side. 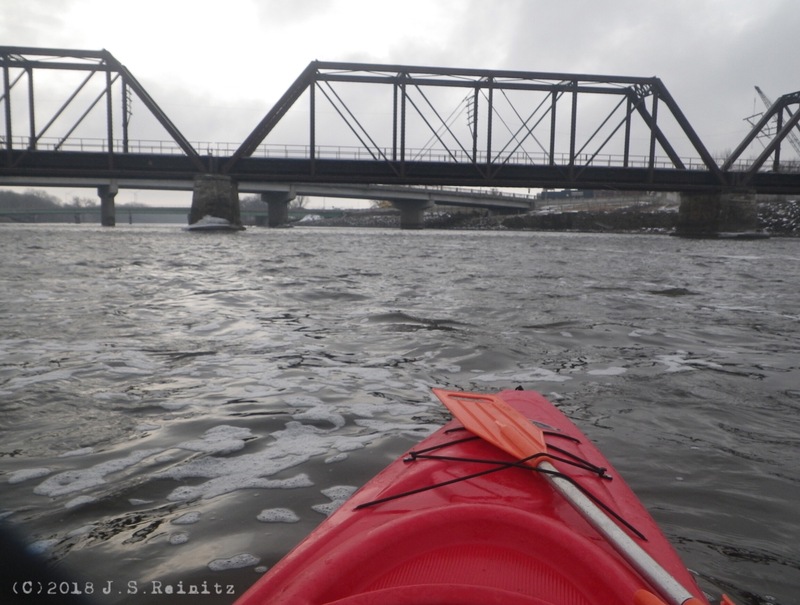 8:15 a.m.: Round the downstream side of the island and begin back upstream to the port. 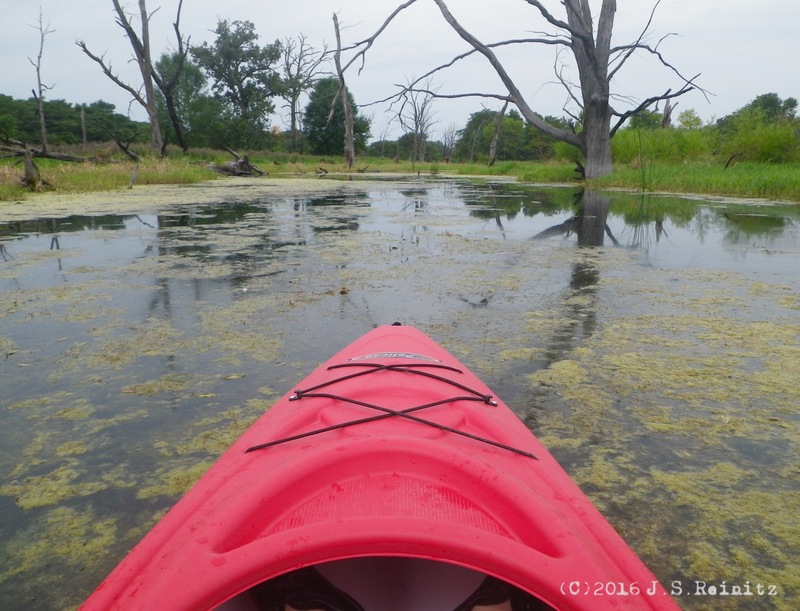 8:25 a.m.: Land at a weed-covered boat ramp that I didn’t notice when I started. Load up the kayak. 8:35 a.m.,: Drop by my favorite downtown, non-franchise coffee shop, discover it doesn’t open until 9:30 a.m. on the weekend. Bah. I took a quick paddle around a local lake for exercise this morning and stopped out at a small island. This little guy came to visit. Not much to write about this time. I’ll let the video do the talking. The film shows a trip through Tham Khoun Xe cave, which envelops about four miles of the Xe Bang Fai river in central Laos. The cave had been closed to foreigners until about 2005. The video is by photographer Ryan Deboodt. His Vimeo video channel is here. For more on Tham Khoun Xe, including a detailed map, check out the July 2009 issue of National Speleological Society’s magazine. Editor’s note: This entry is a little out of season. I finally got around to writing about a fall kayaking trip. Currently, it is 19 degrees Fahrenheit outside with 10 inches of freshly fallen snow. I couldn’t help exploring the narrow tributary that flowed into the stream I was paddling. It was a shallow arm, and the banks were covered with thick vegetation. 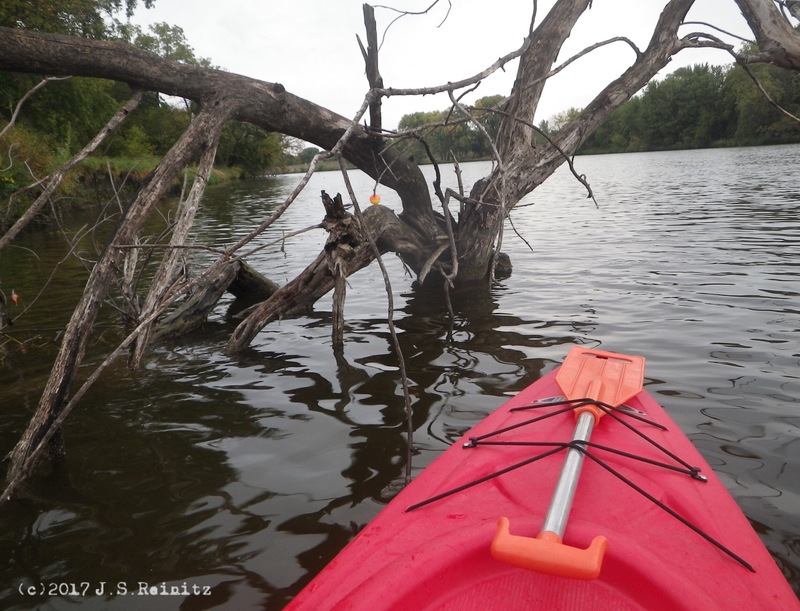 Holding the double-bladed kayak paddle horizontal, I could almost touch both sides. This was definitely something I wanted to investigate. As I made my way up the gentle, claustrophobic flow, I spooked a raft of ducks, which took flight. Further up, I had to duck under low, overhanging branches while rowing. Sometimes, reaching to the silty bottom and poling was required to move forward. Eventually, the surrounding brush cleared, and I reached the source — a large concrete storm drain set in a flood control dike. Such is the fare of ubran kayaking. The short trip had started on the Cedar River by the boathouse. I darted upstream, keenly aware of the dam downriver, and cut across the to the creek, which bisected the grounds of mile-long tractor plant. It meandered under a major road and then a busy highway with the roar of traffic spilling over from the bridges above. The cement bridge supports and undercarriage were decorated with the latest spray paint had to offer. Occasionally, I’d pass a partially submerged cement monolith of unknown origin or shredded lawn furniture on the banks next to a collection of drained beer cans, signs of someone’s secluded fishing spot in the middle of the city. With my free time running out, I landed under another bridge and found what that I thought was hard-packed dirt was actually soft mud that started to envelop my sandals. Freeing myself from the muck, I turned back and started heading back to the boathouse. Here’s another shot from my short trip kayaking around small islands few weeks ago. 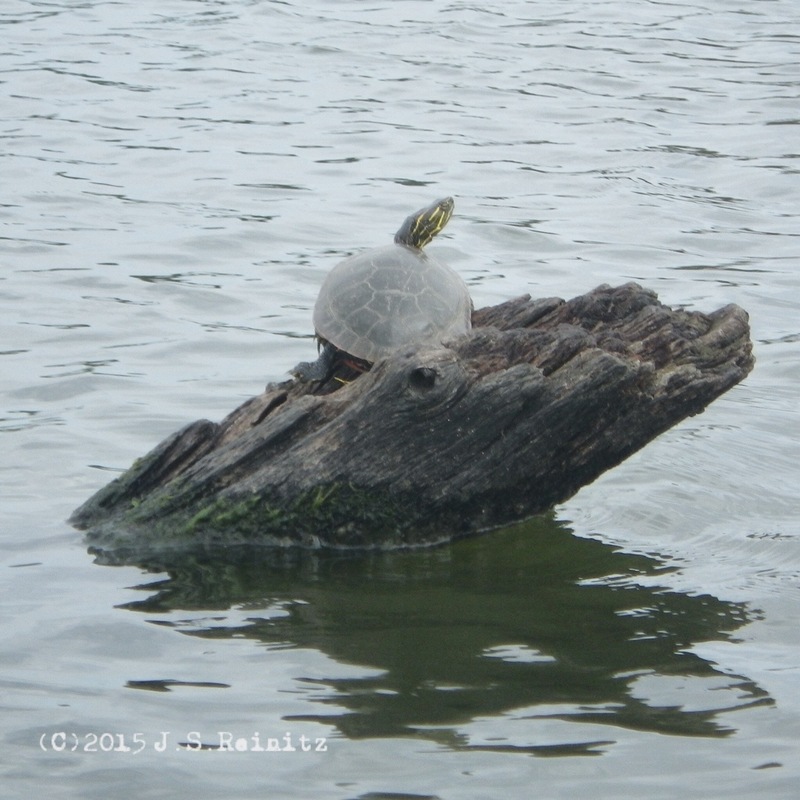 I was able to get close to this turtle perched on a partially submerged branch and snap off a few shots before he got bored of me and slid into the water.